You can download the most recent version at http://darkgdk.com by registering for an account. The DarkGDK release candidate will appear under the "My Products" tab of your account page. - The installer now correctly copies the headers for InitDarkGDK to the application data path as expected. - Renamed dbLightExist to dbIsLight to be consistent with the other command renaming in beta 7. - Fixed a bug where dbSetCameraToImage was using the wrong function export. - tgcauth.exe will now unhide the fields to allow you to license another plugin when clicking on the 'back' button. - dbSetCameraToImage is now correctly evaluating its 'D3DFormat' parameter. - Added missing command SC_Start to (Sparky's) DBP Collision plugin. - Fixed a bug where dbPlayObject and dbLoopObject were evaluating an internal check on every call which should only have been done once. - Added include guards to simpleWindow.h and split simpleWindow.h and initDarkGDK.h definitions into their respective .cpp files. C++ users, update your projects accordingly by adding initDarkGDK.cpp and simpleWindow.cpp along with the updated headers. - Updated documentation help entry for dbKeyState with the updated url from MSDN; also fixed the link so that it is now clickable. - Renamed dbSetGlobalObjectCreationMode to dbSetObjectCreationFlags, modified its acceptable values, and clarified the documentation regarding its behavior. Please update your code accordingly. - Added icons to various files." DarkGDK 2.0 Release Candidate 2 ------------------- Bug fixes: - The installer will no longer crash when a blank username is used when attempting to authorize DarkGDK. - Memblock automatic ID allocation has been restricted to IDs 1-255, a legacy limitation. - Fixed a bug in the C++ header where uint64_t was using the wrong typedef. Updates: - Added the commands dbExcludeLimbOff and dbExcludeLimbOn to the engine. - Added the Dark Shader 'ShaderData.dll' plugin as a core library dependency. - Renamed dbMultiplyMatrix4 to dbMultiplyScalerMatrix4 and dbCompoundMatrix to dbMultiplyMatrix4 for clarity. - Made a few tweaks to the installer. - The uninstaller now properly updates it progress bar. - The installer is now bundled with a DirectX 9 redistributable which also installs itself to ensure functionality on all systems out of the box. The redist is available in the DarkGDK install directory in the 'redist' folder. - Added clarification to authorization errors to differentiate between an actual error and non-connectivity. Also added an additional error code for troubleshooting. - DarkGDK 2.0 is now bundled with all core engine files and no longer requires DarkBasic Professional to be installed prior to running the DarkGDK setup wizard. Additionally, DarkGDK 2.0 no longer requires a DarkBasic Professional license to function. Everything will work out-of-the-box without additional licensing. - Simplified the TGCOnline.exe utility to function as a plugin authorization tool only. - Added 'Authorize TGC Plugins' tool shortcut to the DarkGDK start menu entry. - Added the missing strtable.exe tool from beta 14 to the DarkGDK installation. - Moved everything from the installation directory 'bin' to 'engine'. - Renamed the gdkc.exe plugins directory to 'plugins-lang'. - Added web links to the DarkGDK start menu entry for the DarkGDK and The Game Creators website. DarkGDK 2.0 Release Candidate 1 ------------------- Bug fixes: - The gdkc.exe tool will no longer evaluate invalid string table entries which do not have exports. Updates: - Added registry keys to HKLM/HKCU which identify the DarkGDK install path and version number for third-party developers. - Added an uninstaller and an entry for it in the add/remove programs dialog in the control panel. - The installer now expects a serial number to install. This number can be obtained from your user account at http://darkgdk.com. - Reverted renaming of 'chroma' back to 'color' as the key is actually 1-bit instead of a range of colors. - Removed the builddocs tool and its source code from the DarkGDK SDK for the time being. - The installer now provides better context menu handling. - Corrected some erroneous constants which did not match the documentation. DarkGDK 2.0 beta 14 ------------------- Bug fixes: - dbHideMouse now correctly hides the mouse as expected. Updates: - Added a new tool 'strtable.exe' for extracting string tables from DarkBasic Professional plugins. This tool will work with both licensed and user plugins. - Added several new pages to the documentation regarding command-line tools, engine extensibility, wrapping plugins, and how to add additional language support. - The DarkGDK SDK is now bundled as part of the installer. - The builddocs tool and source code is now bundled with the installer but will not receive any attention or documentation until after DarkGDK 2.0 is released. - Minor changes to libbuilder.h and plugin sources which are incompatible with previous releases. - Added out-of-the-box support for the following plugins: * Intel AppUp Helper Plugin : http://appdeveloper.intel.com/en-us/node/1097 * DarkBasic Professional Enhancement Pack : http://www.thegamecreators.com/?m=view_product&id=2083 * FPSC ODE Physics : (Built into DBP) DarkGDK 2.0 beta 13 ------------------- Bug fixes: - Fixed a few typos which created problems for PureBasic-generated code for recently added plugins. - The documentation for PureBasic wasn't building properly and instead contained the documentation for C++. - Fixed a bug where dbDot with the optional color parameter did not set the ink color as expected. - Fixed a bug in the documentation builder where command cross-references were not parsing outside of the library currently being evaluated. Updates: - Added dbCloseScreen to all example projects where it was missing. - Added an entry for dbCloseScreen to the documentation under 'Fundamentals'. - Tweaked gdkc.exe parameter prefixes to be more consistent. - Fixed a typo in the buldlibs.exe commandline help. - Corrected formatting inconsistencies and innacurate constant references in the documentation. - Renamed dbSprite to dbCreateSprite to be more consistent with other commands names and reordered its parameters to support automatic ID allocation. - Clarified some parameter names and corrected a few inconsistencies. - Added support for RegisterFunctionPtr in Matrix1Util_20.dll. - The gdkc.exe 'libraries' file now only requires a dll name to be listed for it to be included as part of the white-list, greatly simplifying the process required to add support for new libraries. - Added documentation entries for the command-line tools 'gdkc.exe' and 'buildlibs.exe'. - New commands: * dbGetDirect3D * dbGetDirect3DDevice DarkGDK 2.0 beta 12 ------------------- Bug fixes: - Fixed a bug where dbSetObjectFilter was passing its parameters in the wrong order. Updates: - Added out-of-the-box support for the following plugins: * Blitzwerks Terrain : http://www.thegamecreators.com/?m=view_product&id=2286 * Box2D : http://www.thegamecreators.com/?m=view_product&id=2257 * DarkImposters : http://www.thegamecreators.com/?m=view_product&id=2293 DarkGDK 2.0 beta 11 ------------------- Bug fixes: - Fixed a bug where dbLimbName, dbLimbTextureName, and dbEntry were not returning a string as expected. - Fixed a bug where functions which set shader constants were not evaluating structures correctly. Updates: - Added support for full-text search to the documentation. - All documentation generated for a target language will now be compiled to its own .chm file. - Various textual improvements to the library documentation. - Added support for IanM's Matrix1Util library plugins 9, 12, 18, and 26 (for real this time). - Support for DKShop and DKAVM has been removed, as these plugins no longer work. - dbSetDisplayMode now calls dbReloadDisplayPointer internally (part of the DarkShader runtime). - Added a new command dbSetRuntimeErrorCallback to allow logging of runtime errors. - Added several commands introduced by the DarkShader runtime. - Added out-of-the-box support for the following plugins: * A* Pathfinding : http://forum.thegamecreators.com/?m=forum_view&t=114240&b=5 * Advanced Audio : http://forum.thegamecreators.com/?m=forum_view&t=111325&b=8 * Advanced Sprites : http://forum.thegamecreators.com/?m=forum_view&t=113378&b=5 * DarkData : http://www.thegamecreators.com/?m=view_product&id=2067 * DarkInk : http://www.thegamecreators.com/?m=view_product&id=2075 * DarkNet : http://www.thegamecreators.com/?m=view_product&id=2070 * DarkVideo : http://www.thegamecreators.com/?m=view_product&id=2227 * GreenEar : http://www.thegamecreators.com/?m=view_product&id=2227 * Image Kit V2 : http://forum.thegamecreators.com/?m=forum_view&t=177340&b=5 * Matrix1Util : http://forum.thegamecreators.com/?m=forum_view&t=85209&b=18 * Object LOD : http://forum.thegamecreators.com/?m=forum_view&t=159658&b=5 * Quadtree : http://forum.thegamecreators.com/?m=forum_view&t=108837&b=18 - New commands: * dbApplyDynamicCubeMapToObject * dbCreateDynamicCubeMap * dbDeleteCameraEffect * dbDeleteDynamicCubeMap * dbGetCameraEffect * dbIsCameraEffect * dbIsDynamicCubeMap * dbLoadCameraEffect * dbRemoveCameraEffect * dbRenderDynamicCubeMap * dbSetCameraEffect * dbSetCameraEffectConstantFloat * dbSetCameraEffectConstantInteger * dbSetCameraEffectConstantVector * dbSetRuntimeErrorCallback * dbSyncCamera DarkGDK 2.0 beta 10 ------------------- Bug fixes: - Fixed a bug where plugin headers were not evaluating their include path correctly (really fixed it this time). - Corrected some parameter name conflics that were illegal in C++ in a few third-party plugin templates. - Fixed the PureBasic plugin examples to use the new parameter order convention update from beta 7. - Fixed a bug with the C++ language plugin where return types for doubles and 64-bit integers weren't being resolved correctly. - Fixed a bug with the C++ language plugin where function call typedefs for polymorphized functions were not being enumerated. - Fixed a bug where dbCreateObjectTriangle was erroneously passing the wrong parameter type, causing it to fail. Updates: - Updated Sparky's collision library to support the latest 2.05 release. - Updated the D3DFunc library to support the latest 3.7.1 release. - DarkGDK now also copies over the TGC certificates viewer application to help you verify whether a commercial plugin you've installed is properly licensed. - Included plugin templates for third-party plugins have been reevaulated for consistency. Various prefixes have been adjusted align to the prefix-underscore convention. - Updated the D3DFunc library to conform to beta 4 optional parameter specification. - Added example C++ projects for DarkAI, DarkClouds, DarkLights, and DarkPhysics. - The DarkGDK installer will now build the gdkengine.dll with commercial and user plugins by default. - Added support for IanM's Matrix1Util library plugins 9, 12, 18, and 26. - Merged legacy third-party templates into a single file per-library instead of one file per-dll; to be resolved to a single header. - gdkc.exe and buildlibs.exe now print their errors to stderr instead of stdout. DarkGDK 2.0 beta 9 ------------------ Bug fixes: - Fixed a bug where plugin headers were not evaluating their include path correctly. - Fixed creation and load functions which were failing to return the IDs passed to them. - Fixed creation and load functions which were failing to return a unique ID when passed -1 as expected. Updates: - The documentation has received a lot of polish for this release including font style, text placement, new topics, index revisions, as well as a few minor bug fixes. - darkgdk_cpp.chm and darkgdk_purebasic.chm have been merged into darkgdk.chm. All documentation for language targets have been split into aliased folders within the Library/ path of the documentation. Searching the index will now provide links to all supported languages to eliminate ambiguity. - Added new entries for PureBasic and C++ fundamentals, source examples in the documentation, and full walkthroughs on how to setup a project in PureBasic, Visual Studio 2008 and Visual Studio 2010. - Vector and matrix structures now use their fully-qualified name by default (Vector2 vs. v2) for clarity. DarkGDK 2.0 beta 8 ------------------ Bug fixes: - Fixed a bug in Matrix.gdt which was preventing dbCreateMatrix from evaluating correctly. Updates: - The installer now creates start menu entries with links to the documentation, projects, and useful batch files. - The installer now checks for licensing errors when it builds the engine dll during installation an will report the offending library if a problem has occurred. - The installer now checks checks for the existence of a DarkBasic Professional and will provide useful information about where to download it if it cannot be found. This is in contrast to previous versions which simply asked for a directory path. - The installer now verifies whether a compatible version of DarkBasic Professional has been selected. It will not continue unless the correct version (at least 7.7) has been detected. It will also provide useful information about where to download it if it was not detected. - The installer now verifies that the engine dll has been created successfully after calling gdkc.exe. - Various other small bits of polish, fixing typos, and textual changes to the installer. DarkGDK 2.0 beta 7 ------------------ Bug fixes: - dbCameraExist no longer has a default parameter. - Fixed a few erroneous command names: * dbLockpixels -> dbLockPixels * dbStopRecodingSound -> dbStopRecordingSound * dbGetBackbufferWidthWidth -> dbGetBackbufferWidth Updates: - Document commands are also now verified against existing commands in the template libraries to eliminate the documenting of erroneous parameters and non-existent commands. The documentation itself has gotten a major visual overhaul as well. - The documentation builder now has the ability to create .chm documentation for multiple languages using shared templates. Any change to the documentation will propegate to every targeted language. - Added runtime error constants to DarkGDK.gdt as well as the documentation. Every command which returns an error is now documented. - Added the dbSetD3DDeviceCallback command for recovering from an invalid render device. - dbSyncRate now uses DBP's more accurate frame rate limiter. - Added '-v' parameter to buildlibs.exe to provide additional verbose output for aggregating command documentation. Several parameters for this tool have also been adjusted for consistency. - Updated the SDK specification and plugins to support verbose output and new arc/argv parameters. Changes are incompatible with previous beta SDK releases. - Specifying an ID explicitly for creation and load commands which would normally accept an ID is now optional. Many commands have had their parameters reordered for support this behavior. - New commands: * dbIsAdvancedTerrain * dbIsCloth * dbIsCollider * dbIsEffector * dbIsEmitter * dbSetD3DDeviceCallback * dbSetNVPerfHUD - Renamed the following commands to be more specific and/or consistent with other commands: * dbAddMeshToBuffer -> dbAddMeshToVertexBuffer * dbAnimationExist -> dbIsAnimation * dbBitmapExist -> dbIsBitmap * dbCameraExist -> dbIsCamera * dbChangeMesh -> dbReplaceMesh * dbCreateObjectTerrain -> dbCreateAdvancedTerrain * dbCSGDifferenceOnVertexData -> dbCSGDifferenceOnVertexBuffer * dbCSGIntersectionOnVertexData -> dbCSGIntersectionOnVertexBuffer * dbCSGUnionOnVertexData -> dbCSGUnionOnVertexBuffer * dbDeleteMeshFromBuffer -> dbDeleteMeshFromVertexBuffer * dbDestroyTerrain -> dbDeleteAdvancedTerain * dbEffectExist -> dbIsEffect * dbFreeAllClothPoints -> dbDeleteAllClothPoints * dbFreeAllClothPointsOnAllObjects -> dbDeleteAllClothPointsOnAllObjects * dbFreeAllClothPointsOnObject -> dbDeleteAllClothPointsOnObject * dbFreeAllRagdollPoints -> dbDeleteAllRagdollPoints * dbFreeClothNearestPoint -> dbDeleteClothNearestPoint * dbFreeClothPoint -> dbDeleteClothPoint * dbFreeClothPoints -> dbDeleteClothPoints * dbFreeClothPointsRadius -> dbDeleteClothPointsRadius * dbFreeNetGame -> dbDeleteNetGame * dbFreeNetPlayer -> dbDeleteNetPlayer * dbGetBufferIndexCount -> dbGetVertexBufferIndexCount * dbGetBufferIndexData -> dbGetVertexBufferIndexData * dbGetBufferVertexCount -> dbGetVertexBufferVertexCount * dbImageExist -> dbIsImage * dbLimbExist -> dbIsLimb * dbMakeBasicEmitter -> dbCreateBasicEmitter * dbMakeBitmapFromMemblock -> dbCreateBitmapFromMemblock * dbMakeBoxEmitter -> dbCreateBoxEmitter * dbMakeCamera -> dbCreateCamera * dbMakeChaosEffector -> dbCreateChaosEffector * dbMakeCloth -> dbCreateCloth * dbMakeCollisionBox -> dbCreateCollisionBox * dbMakeCollisionDisc -> dbCreateCollisionDisc * dbMakeCollisionPlane -> dbCreateCollisionPlane * dbMakeCollisionSphere ->dbCreateCollisionSphere * dbMakeCollisionSquare -> dbCreateCollisionSquare * dbMakeColorEffector -> dbCreateColorEffector * dbMakeDampingEffector -> dbCreateDampingEffector * dbMakeDragEffector ->dbCreateDragEffector * dbMakeFireParticles -> dbCreateFireParticles * dbMakeFlockEffector -> dbCreateFlockEffector * dbMakeForceEffector -> dbCreateForceEffector * dbMakeGravityEffector -> dbCreateGravityEffector * dbMakeImageFromMemblock -> dbCreateImageFromMemblock * dbMakeLight -> dbCreateLight * dbMakeMatrix -> dbCreateMatrix * dbMakeMemblock -> dbCreateMemblock * dbMakeMemblockFromBitmap -> dbCreateMemblockFromBitmap * dbMakeMemblockFromImage -> dbCreateMemblockFromImage * dbMakeMemblockFromMesh -> dbCreateMemblockFromMesh * dbMakeMemblockFromSound -> dbCreateMemblockFromSound * dbMakeMeshFromMemblock -> dbCreateMeshFromMemblock * dbMakeMeshFromObject -> dbCreateMeshFromObject * dbMakeObject -> dbCreateObject * dbMakeObjectBox -> dbCreateObjectBox * dbMakeObjectCollisionBox -> dbCreateObjectCollisionBox * dbMakeObjectCone -> dbCreateObjectCone * dbMakeObjectCube -> dbCreateObjectCube * dbMakeObjectCylinder -> dbCreateObjectCylinder * dbMakeObjectFromLimb -> dbCreateObjectFromLimb * dbMakeObjectPlane -> dbCreateObjectPlane * dbMakeObjectSphere -> dbCreateObjectSphere * dbMakeObjectTerrain -> dbCreateObjectTerrain * dbMakeObjectTriangle -> dbCreateObjectTriangle * dbMakeParticles -> dbCreateParticles * dbMakePointEffector -> dbCreatePointEffector * dbMakeSizeEffector -> dbCreateSizeEffector * dbMakeSnowParticles -> dbCreateSnowParticles * dbMakeSoundFromMemblock -> dbCreateSoundFromMemblock * dbMakeSphericalEmitter -> dbCreateSphericalEmitter * dbMakeStaticCollisionBox -> dbCreateStaticCollisionBox * dbMakeStaticLimb -> dbCreateStaticLimb * dbMakeStaticObject -> dbCreateStaticObject * dbMakeTerrain -> dbCreateTerrain * dbMakeVortexEffector -> dbCreateVortexEffector * dbMakeWindEffector -> dbCreateWindEffector * dbMakeWrapAroundEffector -> dbCreateWrapAroundEffector * dbMatrixExist -> dbIsMatrix * dbMatrixTilesExist -> dbIsMatrixTextured * dbMemblockExist -> dbIsMemblock * dbMeshExist -> dbIsMesh * dbMusicExist -> dbIsMusic * dbNetGameExist -> dbIsNetGame * dbNetMessageExist -> dbIsNetMessage * dbObjectExist -> dbIsObject * dbParticlesExist -> dbIsParticles * dbPixelShaderExist -> dbIsPixelShader * dbSetImageColorkey -> dbSetImageChromaKey * dbSetStaticPortalsOff -> dbHideStaticPortals * dbSetStaticPortalsOn -> dbShowStaticPortals * dbSoundExist -> dbIsSound * dbSpriteExist -> dbIsSprite * dbTerrainExist -> dbIsTerrain * dbUnlockBuffer -> dbUnlockVertexBuffer * dbVertexShaderExist -> dbIsVertexShader * dbChangeMeshFromMemblock -> dbReplaceMeshWithMemblock - Reordered parameters to support automatic ID allocation * dbCloneObject(ObjectCloneID, SourceID, SharedDataFlag) -> (SourceID, ObjectCloneID, SharedDataFlag) * dbCopyMemblock(SourceID, MemblockID, SourceStartPos, DestinationStartPos, Length) -> (SourceStartPos, DestinationStartPos, Length, SourceID, MemblockID) * dbCreateAnimatedSprite(SpriteID, FileName.s, Across, Down, ImageID) -> (FileName.s, Across, Down, ImageID, SpriteID) * dbCreateBasicEmitter(EmitterID, ParticleCount) -> (ParticleCount, EmitterID) * dbCreateBitmap(BitmapID, Width, Height) -> (Width, Height, BitmapID) * dbCreateBitmapFromMemblock(BitmapID, MemblockID) -> dbCreateBitmapFromMemblock(MemblockID, BitmapID) * dbCreateBoxEmitter(EmitterID, ParticleCount) -> (ParticleCount, EmitterID) * dbCreateFireParticles(ParticleID, ImageID, Frequency, x.f, y.f, z.f, Width.f, Height.f, Depth.f) -> (ImageID, Frequency, x.f, y.f, z.f, Width.f, Height.f, Depth.f, ParticleID) * dbCreateImageFromMemblock(ImageID, MemblockID) -> dbCreateBitmapFromMemblock(MemblockID, ImageID) * dbCreateMatrix(MatrixID, Width.f, Depth.f, xSegments, zSegments) -> (Width.f, Depth.f, xSegments, zSegments, MatrixID) * dbCreateMemblock(MemblockID, Size) -> (Size, MemblockID) * dbCreateMemblockFromBitmap(MemblockID, BitmapID) -> (BitmapID, MemblockID) * dbCreateMemblockFromImage(MemblockID, ImageID) -> (ImageID, MemblockID) * dbCreateMemblockFromMesh(MemblockID, MeshID) -> (MeshID, MemblockID) * dbCreateMemblockFromSound(MemblockID, SoundID) -> (SoundID, MemblockID) * dbCreateMeshFromMemblock(MeshID, MemblockID) -> dbCreateBitmapFromMemblock(MemblockID, MeshID) * dbCreateMeshFromObject(MeshID, ObjectID) -> (ObjectID, MeshID) * dbCreateObject(ObjectID, MeshIndex, ImageID) -> (MeshIndex, ImageID, ObjectID) * dbCreateObjectBox(ObjectID, Width.f, Height.f, Depth.f) -> (Width.f, Height.f, Depth.f, ObjectID) * dbCreateObjectCone(ObjectID, Size.f) -> (Size.f, ObjectID) * dbCreateObjectCube(ObjectID, Size.f) -> (Size.f, ObjectID) * dbCreateObjectCylinder(ObjectID, Size.f) -> (Size.f, ObjectID) * dbCreateObjectFromLimb(ObjectID, NewObjectID, LimbID, CopyAllFlag) -> (ObjectID, LimbID, CopyAllFlag, NewObjectID) * dbCreateObjectPlane(ObjectID, Width.f, Height.f, Orientation) -> (Width.f, Height.f, Orientation, ObjectID) * dbCreateObjectSphere(ObjectID, Size.f, Rows, Columns) -> (Size.f, Rows, Columns, ObjectID) * dbCreateObjectTriangle(ObjectID, x1, y1, z1, x2, y2, z2, x3, y3, z3) -> (x1, y1, z1, x2, y2, z2, x3, y3, z3, ObjectID) * dbCreateParticles(ParticleID, ImageID, Frequency, Radius.f) -> (ImageID, Frequency, Radius.f, ParticleID) * dbCreateSnowParticles(ParticleID, ImageID, Frequency, x.f, y.f, z.f, Width.f, Height.f, Depth.f) -> (ImageID, Frequency, x.f, y.f, z.f, Width.f, Height.f, Depth.f, ParticleID) * dbCreateSoundFromMemblock(SoundID, MemblockID) -> dbCreateBitmapFromMemblock(MemblockID, SoundID) * dbCreateSphericalEmitter(EmitterID, ParticleCount) -> (ParticleCount, EmitterID) * dbCreateTerrain(TerrainID, HeightmapFileName.s) -> (HeightmapFileName.s, TerrainID) * dbGetImage(ImageID, Left, Top, Right, Bottom, TextureFlag) -> (Left, Top, Right, Bottom, TextureFlag, ImageID) * dbInstanceObject(ObjectID, SourceID) -> (SourceID, ObjectID) * dbLoadEffect(FileName.s, EffectID, TextureFlag, DoNotGenerateExtraData) -> (FileName.s, TextureFlag, DoNotGenerateExtraData, EffectID) * dbLoadEffect(FileName.s, EffectID, TextureFlag, DoNotGenerateExtraData) -> (FileName.s, TextureFlag, EffectID, DoNotGenerateExtraData) * dbLoadImage(FileName.s, ImageID, TextureFlag) -> (FileName.s, TextureFlag, ImageID) * dbLoadMesh(FileName.s, MeshID) * dbLoadObject(FileName.s, ObjectID, TextureMode, TextureReduce) -> (FileName.s, TextureReduce, TextureMode, ObjectID) * dbLoadPixelShader(FileName.s, PixelShaderID) * dbLoadVertexShader(FileName.s, VertexShaderID) * dbRecordSound(SoundID, Duration) -> (Duration, SoundID) * dbReplaceMeshWithMemblock(MeshID, MemblockID) -> dbReplaceMeshWithMemblock(MemblockID, MeshID) DarkGDK 2.0 beta 6 ------------------ Updates: - Removed legacy code required to support syncing in previous versions of DBP. The DBP 7.7 release candidate is now REQUIRED to be installed BEFORE installing DarkGDK. Sync will NOT work without it! - Thread safety code is now disabled by default providing performance improvement of up to 20%. To reenable thread safety, pass the #kGDK_ThreadSafe flag to dbOpenScreen. DarkGDK 2.0 beta 5 ------------------ Updates: - Added an optional depth parameter to dbOpenScreen. If 0 is passed then it will default to the screen depth. - Added dbSetDisplayMode. Somewhere it went missing in DarkGDK 2.0 but it's back! If 0 is passed for the Depth parameter then it will default to the screen depth. If 0 is passed for the BackBufferWidth or BackBufferHeight parameter it will default to the specified width/height for the DBP screen resolution. DarkGDK 2.0 beta 4 ------------------ Updates: - Major changes to the DarkGDK plugin SDK specification which are incompatible with previous beta SDK releases. - Completed full support for DBP-compatible plugins. The library builder is now capable of handling multiple instances of functions of the same name but with different parameters. Code generation is entirely dependent on the plugin's implementation. - Minor changes to the template specification and buildlibs.exe parsing routines. DarkGDK 2.0 beta 3 ------------------ Bug fixes: - gdkc.exe will now report an appropriate error if an illegal command is used to specify a plugin. - Fix a bug where functions returning a string would cause the program to become unstable. - Updated the following commands to work with DBP 7.5: * dbAddMeshToBuffer * dbDeleteMeshFromBuffer * dbGetBufferIndexCount * dbGetBufferVertexCount * dbGetVertexDiffuse * dbGetVertexNormalsX * dbGetVertexNormalsY * dbGetVertexNormalsZ * dbGetVertexPositionX * dbGetVertexPositionY * dbGetVertexPositionZ * dbGetVertexU * dbGetVertexV * dbLockVertexBufferForLimb * dbLockVertexBufferForMesh * dbSetBufferDiffuse * dbSetBufferIndexData * dbSetBufferNormals * dbSetBufferPosition * dbSetBufferUV * dbUnlockBuffer Updates: - Renamed dbSetIndexData to dbSetBufferIndexData. - Updated gdkc.exe to support unix-style command line parameters. See gdkc.exe --help for a list of options. - Added the parameter '-all' to gdkc.exe to support compiling the engine with existing plugins which have been properly configured. This is now the default behavior invoked by the installer. - Added preliminary support for plugins. This feature will be enhanced in a future version to properly address default parameters. - Added PureBasic example projects for cloth and advanced terrain and some TGC plugins. DarkGDK 2.0 beta 2 ------------------ Bug fixes: - dbSetD3DDeviceCallback and all functions from the 3d math functions were using the wrong calling convention and corrupting the stack. - Updated several templates which were passing the wrong type. - Fixed dbSetEffectConstantVector, dbSetEffectConstantMatrix, dbSetVertexShaderVector, and dbSetVertexShaderMatrix which were not passing their vector and matrix parameters as expected. - Fixed a memory leak for all functions which return a string. - Fixed a bug where the beta can expire early if the computer spends a lot of time in hibernation. Updates: - Added a new C++ plugin to the library builder for header generation. - Added C++ examples for make/g++, nmake/vc++, vs6, vs2002, vs2003, vs2005, vs2008, and vs2010. - Added new supplemental typing to templates to add support for type strict languages like C++. - Updated the library builder plugin specification. The new specification is incompatible with the one from beta 1. - Added the command dbCloseScreen for instances where it is necessary to perform the cleanest possible program termination. Some compilers are less forgiving than others. - Significantly increased the delay allowed for the engine to start up on slower processors. - The installer will no longer crash when a blank username is used when attempting to authorize DarkGDK. - Memblock automatic ID allocation has been restricted to IDs 1-255, a legacy limitation. - Fixed a bug in the C++ header where uint64_t was using the wrong typedef. - Added the commands dbExcludeLimbOff and dbExcludeLimbOn to the engine. - Added the Dark Shader 'ShaderData.dll' plugin as a core library dependency. - Renamed dbMultiplyMatrix4 to dbMultiplyScalerMatrix4 and dbCompoundMatrix to dbMultiplyMatrix4 for clarity. - Made a few tweaks to the installer. - The uninstaller now properly updates it progress bar. - The installer is now bundled with a DirectX 9 redistributable which also installs itself to ensure functionality on all systems out of the box. The redist is available in the DarkGDK install directory in the 'redist' folder. - Added clarification to authorization errors to differentiate between an actual error and non-connectivity. Also added an additional error code for troubleshooting. - DarkGDK 2.0 is now bundled with all core engine files and no longer requires DarkBasic Professional to be installed prior to running the DarkGDK setup wizard. Additionally, DarkGDK 2.0 no longer requires a DarkBasic Professional license to function. Everything will work out-of-the-box without additional licensing. - Simplified the TGCOnline.exe utility to function as a plugin authorization tool only. - Added 'Authorize TGC Plugins' tool shortcut to the DarkGDK start menu entry. - Added the missing strtable.exe tool from beta 14 to the DarkGDK installation. - Moved everything from the installation directory 'bin' to 'engine'. - Renamed the gdkc.exe plugins directory to 'plugins-lang'. - Added web links to the DarkGDK start menu entry for the DarkGDK and The Game Creators website. - Added registry keys to HKLM/HKCU which identify the DarkGDK install path and version number for third-party developers. - The installer now expects a serial number to install. This number can be obtained from your user account at http://darkgdk.com. - Reverted renaming of 'chroma' back to 'color' as the key is actually 1-bit instead of a range of colors. - Removed the builddocs tool and its source code from the DarkGDK SDK for the time being. - Corrected some erroneous constants which did not match the documentation. - Added a new tool 'strtable.exe' for extracting string tables from DarkBasic Professional plugins. This tool will work with both licensed and user plugins. - The DarkGDK SDK is now bundled as part of the installer. - The builddocs tool and source code is now bundled with the installer but will not receive any attention or documentation until after DarkGDK 2.0 is released. - Added an entry for dbCloseScreen to the documentation under 'Fundamentals'. - The gdkc.exe 'libraries' file now only requires a dll name to be listed for it to be included as part of the white-list, greatly simplifying the process required to add support for new libraries. - Added documentation entries for the command-line tools 'gdkc.exe' and 'buildlibs.exe'. - DarkGDK now also copies over the TGC certificates viewer application to help you verify whether a commercial plugin you've installed is properly licensed. - The DarkGDK installer will now build the gdkengine.dll with commercial and user plugins by default. - darkgdk_cpp.chm and darkgdk_purebasic.chm have been merged into darkgdk.chm. All documentation for language targets have been split into aliased folders within the Library/ path of the documentation. Searching the index will now provide links to all supported languages to eliminate ambiguity. - Added runtime error constants to DarkGDK.gdt as well as the documentation. Every command which returns an error is now documented. - Removed legacy code required to support syncing in previous versions of DBP. The DBP 7.7 release candidate is now REQUIRED to be installed BEFORE installing DarkGDK. Sync will NOT work without it! - Added dbSetDisplayMode. Somewhere it went missing in DarkGDK 2.0 but it's back! If 0 is passed for the Depth parameter then it will default to the screen depth. If 0 is passed for the BackBufferWidth or BackBufferHeight parameter it will default to the specified width/height for the DBP screen resolution. - Major changes to the DarkGDK plugin SDK specification which are incompatible with previous beta SDK releases. - Added the parameter '-all' to gdkc.exe to support compiling the engine with existing plugins which have been properly configured. This is now the default behavior invoked by the installer. This list is not finite! DarkGDK will "just work" with any standards-compliant C++ compiler. This includes any version of Visual Studio Express, g++, Borland, Watcom, Intel, Comeau, etc. Here is a video of a C++ example project being run and debugged from the Qt Creator IDE. It also demos the flexibility of DarkGDK by compiling from a UNIX (cygwin) command line using Make and the GNU g++ compiler. It should work with most any C/C++ compiler. DarkGDK has built-in support for multithreading by providing function-level critical sections for your convenience behind the scenes as well as thread-aware error handling. Each function can have several possible error codes which can be detected are caught at runtime for you to examine and respond to. Compile language-specific header files from pre-generated templates. These header files contain function definitions for every command supported by DarkGDK and associated plugins. Usage: buildlibs file -plugin <plugin> [options] Options: --help Display this information. --help-plugins Display help information for all plugins. --ext-header <arg> Set the output extension of the output header file. --ext-lib <arg> Set the output extension of the output library file. --header <file> The file name of the primary header file. All header files created by this tool will be appended to it. --lcasefile Set the output file name to lower-case. -o <file/path> Specifies the location and/or name of the header file to be written to disk. If no file is specified then the base name will be used. -q Disable all text output at the command line. --plugin <plugin> Load a specific plugin for the target language --plugin-args <arg> Passes a string of additional command line switches to the plugin for additional processing. --prefix-header <arg> Set the output prefix of the output header file. --prefix-lib <arg> Set the output prefix of the output library file. -v <detail|docs> Specifies additional verbosity for the command line output. By specifying 'detail', the function name and its parameters will be displayed. The 'docs' option will format the output specifically to be parsed by the documentation builder. The DarkGDK installer should automatically generate header files as well as build a complete engine .dll from all of the DarkBasic Professional core libraries. If you need to generate these files again, there are batch files to automate the process in the DarkGDK install directory. Unlike DBP and DarkGDK 1.0, in DarkGDK 2.0, the renderable area is separate from the actual window. As you can see from this example code, dbOpenScreen accepts a target window handle "hWnd" which tells it where to render the output. This allows DarkGDK to render to "any" window owned by the process and is not limited to any one implementation. For example, you can use DarkGDK with GLUT, Qt, Win32, wxWidgets, etc. There are a lot of changes compared to DBP and the old DarkGDK. It is not targeted as being 1:1 compatible with older releases of DarkGDK and there will be growing pains while you encounter the differences. However, the idea behind DarkGDK 2.0 is to bring evolution to the engine to streamline it and in the end make it easier to use as well as being portable to other languages. Don't forget! DarkGDK is also compatible with all DarkBasic Professional plugins and includes many headers to provide support out-of-the-box. An SDK is also provided which allows anyone to add support for additional languages!! but do i have to purchase it or can i use it for free for unlimited time? Holy hell this is a large update, all sorts of cool new features! Any ideas on the release timeframe? Quote: "but do i have to purchase it or can i use it for free for unlimited time?" It's free for download while in beta. Go try it now! Quote: "Any ideas on the release timeframe?" It's out right now. Go register an account and download it from http://darkgdk.com! I've just downloaded it, really looking forward to testing out how fast it is. DarkGDK needed a dedicated developer! When I can scrape the money together, I will definitely pay for the full version. Has PureDGK been rebranded as DarkGDK then? Quote: "Has PureDGK been rebranded as DarkGDK then? " I can't seem to download it, I get around 10Mb downloaded (while the file is stated to be ~92Mb in size) after which the download terminates. This seems to coincide with the session on your website timing out, was wondering if there is anything to that? When I migrated everything to DarkGDK.com I also moved to a new hosting service which is causing connection issues. I am currently working on resolving this problem as quickly as possible. In the interim, the website service may go down while changes are in progress. Quote: "DarkGDK supports only the full screen windowed method of creating full screen applications. Full screen exclusive mode is not supported by DarkGDK. Quote: "!!! why?? planned in the final version I hope !! without this i dont think use GDK 2.0"
Full screen exclusive move is not supported. This is an archaic relic of the past which was previously necessary due to memory constraints with video memory. You can still run an application in full screen and adjust the user's resolution as necessary. Does Dark Dynamix works with new version of DarkGDK (i.e. DarkGDK 2.0) ? Quote: "Does Dark Dynamix works with new version of DarkGDK (i.e. DarkGDK 2.0) ?" The next release candidate will support this plugin. any idea when darkgdk.com will be back up? Quote: "when D3Dformat is set, the image seem to be not created..(GDK 2.0 RC2)"
You're right. There was a typo where dbSetCameraToImage was using the wrong export for this function. This has been fixed for the next beta. entry in the start menu. Almost like it just skipped that step. "imagination is more important than knowledge" -- Albert Einstien. There is no entry for "Start > All Programs > DarkGDK"? This is the first I've heard of it. Did you choose any other options other than the defaults during the install? the program files> darkgdk> compile headers.bat also opens about 6 windows to program data> darkgdk>. I've also noticed some "empty" html files. (there is nothing in them, not even an html tag when opened with notpad). I can send you the info on my system if that would help. Is there a problem with the DarkGDK website? I try to login but says "incorrect username or password". If I try to do a recover password, it tells me that username doesn't exist. If I try to create a new login, no matter what email I use, it tells me that email already exists. Mistrel, Is GDK 2 faster than the original? So I tried to purchase this today. Also, how about supplying some other option to paypal? Skrill for instance always works a lot better for me than the afforementioned service.. *hint*. Quote: "However, your paypal service is apparently discriminating me because I don't live in the USA (it prompts me to enter a "valid city/state" combination). I don't think making something up is wise when it comes to money transfers..."
What are you trying to enter that's giving you trouble? Would you mind sending me an e-mail with the information? For one thing I can't enter my last name which contains the letter 'ö'. But that's on the previous page (before the actual paypal section); I'm quite used to that and tend to just type an O instead. I don't think that should result in any problems. (The PayPal form itself supports such special characters by the way). As you can see it requires a state to be selected (AA is in the box currently; I tried not choosing any and that didn't work either). Since Stockholm is obviously not a town in any of the states in the drop down list it doesn't approve. The phone number error is probably just due to incorrect formatting and hence not relevant. 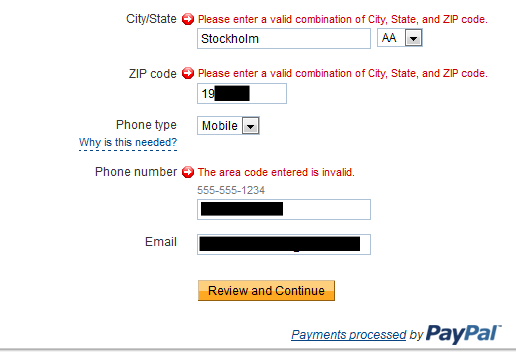 Quote: "Since Stockholm is obviously not a town in any of the states in the drop down list it doesn't approve." Did you select your country at the top of the form? does this work with PureBasic 4.61? Quote: "does this work with PureBasic 4.61?" It's a dynamically linked wrapper, so yes it should be compatible with 4.61. I haven't yet migrated to the latest PB but as far as I know Fred (lead PureBasic developer) has not introduced any ground breaking changes in the way DLL's are accessed. Have fun! Quote: "Did you select your country at the top of the form?" Can't believe I missed that field. if you paid for dark gdk do you have to pay for this too. If you had box2d in it making it more compatible with agk I would bought it already. Quote: "if you paid for dark gdk do you have to pay for this too. If you had box2d in it making it more compatible with agk I would bought it already." DarkGDK 1.0 commercial users will be entitled to a free upgrade on release. Box2D is already supported out-of-the-box. If I buy "Dark Game Studio" Bonanza pack which contains Dark GDK 1.0 - does it entitle me for a free upgrade to Dark GDK 2.0 ? site "darkgdk.com" - doesn't work!!! Sounds pretty awesome, I was pretty eager to test this out and the set up process seems simpler than the standard GDK set up, but sadly I did come across this error when I followed the set up in the help documents for VS2010 (and watched the set up video for 2008 as well) and when I tried to run some of the samples. Quote: "1>LINK : fatal error LNK1181: cannot open input file 'DarkSDK.lib'"
Unfortunately I'm not really that experienced with C++ and am a C# user normally, so I wouldn't know where to begin in sussing this out. I am using Visual Studio 2010 Express. Quote: "1>LINK : fatal error LNK1181: cannot open input file 'DarkSDK.lib"
This is not a DarkGDK 2.0 error as there is no such file DarkSDK.lib. You're most likely attempting to either mix DarkGDK 1.0 with 2.0 or something is configured improperly in your IDE. It might have come from trying to set up Dark GDK 1.0 previously, obviously I've done something wrong. Quote: "site "darkgdk.com" - doesn't work!!!" If you're still having this problem, I had the same one. It seems my dns server has a problem resolving it without the www. before it. anyone point me in the right direction to track down this error ? Tried compiling the free RC4 today and was informed that the beta period has expired. I couldn't find anywhere that this would be the case. Will it be updated, or is it paid only now? I was bummed about this as I was just starting to get the feel of everything. Quote: "Will it be updated, or is it paid only now?" It's free while in RC status. Final will require a purchase. Customers who bought commercial copy of DGDK v1.0 will supposedly get a free upgrade. We're all expecting RC5 now. Can't wait for RC5 myself. I have pretty much my entire game engine ported from DarkBASIC Professional over to C++ and just need the Dark Dynamix support to get it in a matching state. Have had no problems whatsoever so far and I am absolutely loving version 2. Thanks for all the hard work, Mistrel. yes for now we cannot use RC4 anymore..
need to wait to RC 5 , does anyone knows when RC 5 comes out? mistrel care to share your thoughts about it? If I bought it am I supposed to be able to download the full version or is it not released yet? I don't want to wait because the beta runs out. It's been 3 days by the way since I bought DGDK. well beta relese means there is no full version yet. But if I bought it shouldn't I get access to a beta that doesn't expire at least? Thank you for your purchase from DarkGDK.com. Your account has been credited with your purchase. You can download your software at any time by logging into DarkGDK.com and accessing your account from the navigation menu. If you have any questions regarding your order you can contact support at support@darkgdk.com. maybe check your emails - if not contact them at that email i guess ?